Tecmaster Operatives have both the experience and correct access methods for this type of clean. This type of clean is performed after the installation of a new kitchen and prior to the kitchen opening. The installation of a new kitchen or kitchen equipment is very often coupled with building works within the premises which can result in a build-up of dirt and dust. Prior to the kitchen being used the recommendation is for the above clean to be performed. This process will thoroughly clean all kitchen equipment and remove any dust, dirt and building works residue. 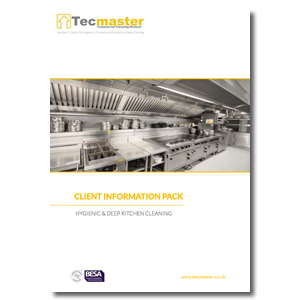 Tecmaster operatives use specialist food safety chemicals to provide a comprehensive clean whilst adhering to health and safety standards.